I know. It’s not my usual Saturday shopping stop, but when there’s only one retailer for miles around, what are you gonna do? 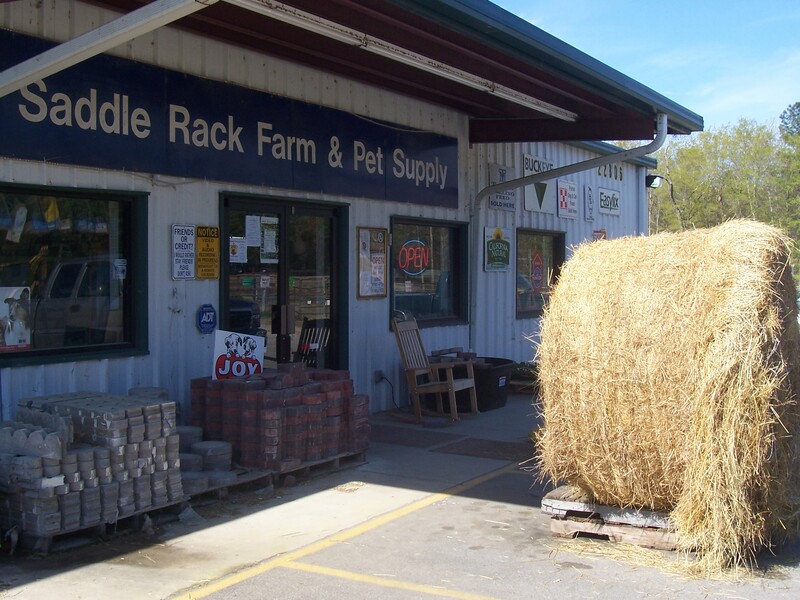 I was in Elkmont, Alabama, headed for a cheese-making class at Humble Heart Farms — http://humbleheartfarms.com/ — when the hay bale in front of the Saddle Rack Farm & Pet Supply beckoned me. Actually, it was the llamas, roosters and other assorted animals in the front fenced-off area near the highway that grabbed my attention, but sadly they wouldn’t cooperate for photos so I only can promise you that they were there. I love poking around feed and farm stores — my love for Rural King, the farm/home store found mainly in Illinois and Indiana, is well documented. Something about hanging out with bins of seeds and samples of fencing reminds me of when I was little and I’d go places with my dad. We didn’t have a farm (although he has a nursery now) so I’m not sure why I associate feed stores with him. But he did sell John Deere industrial tractors and for years we had a vegetable garden, so mud, dirt and dust were familiar parts of my childhood. But we never had a hay bale in a front yard. My dear husband, on the other hand, did grow up on a farm and so probably is not as fascinated with feed stores as I am. This entry was posted in Alabama, family, shopping, Tennessee and tagged agricuture, Alabama, childhood memories, family, farming, farms, shopping by Coffee with Cathy. Bookmark the permalink. Well, honey, I reckon they still do exert a certain fascination. I used to love to go with by dad to the Ellis Gray feed store in Murfreesboro. We would take corn to be milled into feed, as I recall. It was a Purina dealer and had a big mural on the back wall of the main office that depicted all the kinds of “chow” that Purina sold … including Monkey Chow. I have always wanted to buy a bag of Monkey Chow. JP, Dear Husband — Aw, I love it when you talk farm. Is it possible that maybe you and I crossed paths as kids with our dads at a middle Tennessee feed store??? Mary Bonnie — I am slapping my forehead because you are right: I did not think to invite y’all along. You would have loved this! I’ll keep you posted about the next one. Wait a minute! You know how I love cheese, why, oh why, wasn’t I involved in the cheese trip? Evelyn — How could I have forgotten that you are cheese’s No. 1 fan???!! !